As you consider different roofing options, you will find extensive information about TPO, especially since it has quickly become one of the most popular options in roofing materials. TPO stands for thermoplastic polyofin and it actually is a name that covers a variety of different materials that feature polypropylene and propylene diene monomer. As you will see, there are many advantages to TPO, which make it an ideal option for many different roofing situations. What Are the Properties of TPO? To begin with, you need to consider the properties of TPO, as in what it has to offer when it is used for a roofing material. So, let’s look at what you would be getting if you chose this for your roofing option. It is a white material, which means it will work to reflect sunlight away from the building. In fact, TPO will reflect about 78% of the energy from the sun’s rays. TPO is extremely durable and is resistant to fire, V rays, pollutants, and bacteria. The material does not contain chlorine, which means it will not harm the environment. It is a fairly low-cost option, which is ideal in many roofing situations. TPO comes in different widths, including eight, ten, and twelve foot. This way, with fewer seams, the labor cost of installing it will be much lower than other materials. This material offers a thicker top ply, which is ideal in a roofing material. This lightweight material works to keep moisture out and can work in almost any environment, which means it can be used in retrofitting projects as well as new builds. TPO remains flexible whether it is hot or cold outside, and that means there will not be a risk of cracking. Finally, the membrane is easy to repair, meaning it can last for a long time while remaining new in appearance. For most people, the advantage of TPO would be the lower cost, but as you can see, this is only one of the properties to consider. Why Should You Consider a TPO Membrane Roof? TPO offers a low-cost installation and easy repair, which means not spending as much money for the whole life of the roof. Additionally, since this is an energy efficient option, it will provide even more savings when it doesn’t take as much to cool the property. Why Is TPO Used in Mobile Home Roof Overs? 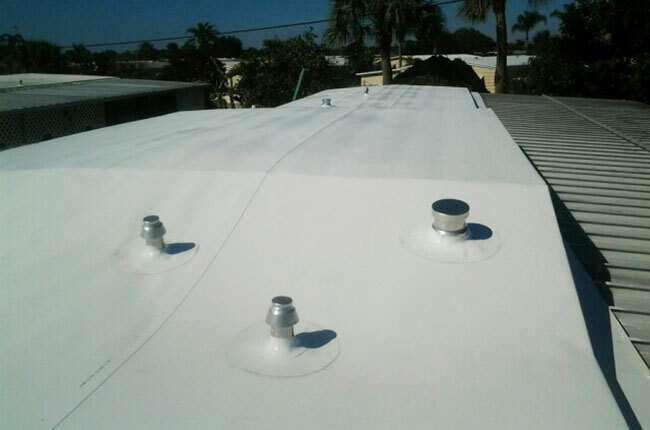 TPO is especially useful for roof overs because it does have such an energy efficient quality. Mobile homes often have a very low level of energy efficiency, and making this one roofing change can be enough to enjoy large saving on energy bills. Additionally, due to the different widths in the material, TPO is also very easy to install on mobile homes of any size. Since the material is so dependable against a variety of different types of environmental damage, it will likely last the whole life of the mobile home. If you would like to find out more about your roofing options with TPO, whether you are working on a new build or you wish to consider a roof over, then be sure to contact us. You can fill out our free online form or give us a call at 800-297-3758. We are available 24-hours a day so that we can answer your questions and help you make the right decision for your roofing project.